Spider Web quilt blocks are rather particular piecing to make them lie perfectly flat when done. Most triangular pieces can be cut on a true bias with threads on two sides parallel with the weave of the material. But this, not being a right triangle, cannot cut a true bias which means care must be taken to keep the long	sides from stretching. Piece the bases onto the long triangles first, then sew four pie-shaped pieces together for each half block. Put on the corner triangles, and sew one long seam through to complete. For a full size quilt, set together with white 11 inch squares, allow 5 1/2 yards of white and 3 yards of a	color. You will need 28 pieced blocks and 28 plain ones, or 7 blocks wide by 8 blocks long, making the quilt finish 77 by 88 inches.Allow extra for seams on all blocks. For a twin size estimate the length of course is always the same, but the width may be planned any size from 63 inches to 78 inches depending on how much one wants it to hang over the sides. For a Spider Web Quilt, twin size, you may use 6 blocks by 8, finishing 66 by 88 inches, which would require about 2 1/2 yards of light color, with 4 3/4 yards or dark. 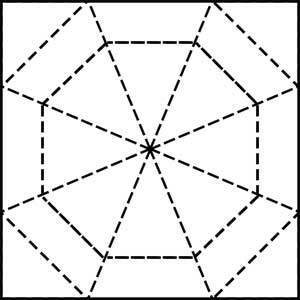 Click on image to print the 5" block of the Spider Web Quilt Block.